I travelled from Leningrad (as St. Petersberg was known, this was still the Soviet Union at that time) to Moscow to perform and meet puppet groups in these two fine cities. A week long festival in Naples, playing along side many performers from all over the world. One of the highlights of this festival was being on the same bill as Rudolph Nureyev, who performed a ballet performance of Pulcinella. Two weeks traveling around China performing for and meeting resident puppet troupes. One highlight was performing in a primary school in southern China for children who had no idea we were coming to perform, I will never forget the amazement on their faces. What a trip! See my full report below. Again, see my report below. If you are a festival organiser and would like to book me for your event, please see the contact area of this and get in touch. I look forward to hearing from you soon. I have also now appeared at the 28th Internationale PuppenTheaterTage - Mistelbach / Austria 24th to 29th October 2006 festival. Under the artistic direction of Gino Balestrino and Carlo Timossi the festival of puppets from all over europe took place in the wonderful city of Genoa (European City of Culture this year). I was lucky enough to be invited to perform two shows per day on the last two days. My friend Ben and I flew from Gatwick early on Friday (28th May) directly to Genoa airport right next to the centre of town, where we were met by two lovely ladies Stefania and Maria as arranged and were taken to met Gino at the first area in which I was to perform the next day. This was a park outside a brand new shopping centre called Parco della Fiumara. A great setting to perform, with seating and a stage. After making our introductions and getting to know Gino and the others over a beer or two, we were then taken to our very nice hotel near the train station. On both days, I was quite lucky that I had to perform in late afternoon/early evening, so this gave us time to have a good look around the city and relax a bit more, not having to get up at the crack of dawn every day, which is good when you have been out the night before sampling Italian hospitality. I was also to find out why the performances were later than we would have in the UK. There are two main factors. The first being that everything seems to closed for the afternoon and the place goes very quite, with everyone staying out of the sun and having a sleep/relax after starting work early and the second is the sun and heat. Whilst performing, I run with sweat, having been out the front in my blazer, shirt and tie, time I got in the booth to perform I was already dripping and by the end, soaked through. I would have time to dry off a little before having to do it all over again. I only performed along side one other performer whilst there (there were many performers, but spread all over Genoa), Fabularia from Vienna performing "Come Kasper divento Re". This chap could speak fluent Italian, and has performed in Italy alot, so he was used to it. I myself cannot speak any Italian, so had the up-hill struggle with the language barrier. 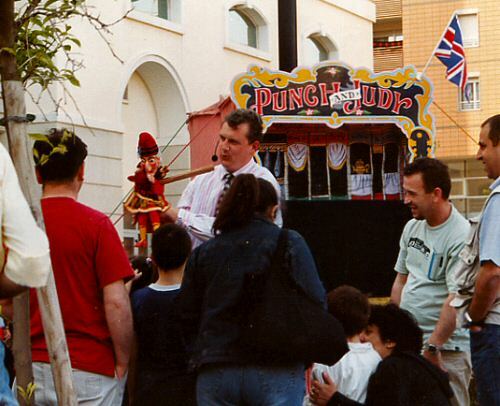 This said, Punch and Judy always goes down well and you have to cater for the fact you cannot speak Italian and they cannot speak English (well not at the pace of a P&J show), so I enhanced the slapstick elements of the show more and tried harder with the shouting bits, but it was not easy work. You have to give it your all to get the reaction you want from the children as they will not join in like in the UK, but the reaction is still there and very enjoyable. I went out in front of the booth afterwards with Mr Punch and the crocodile and let the children shake hands with Punch and let the croc snap at them, which they loved. Many people would come up and want to talk to you and say hello, very nice people and very open, which is not an English trait, so it is really nice to work with audiences like this. The children were very excitable and enjoyed all the entertainment provided. 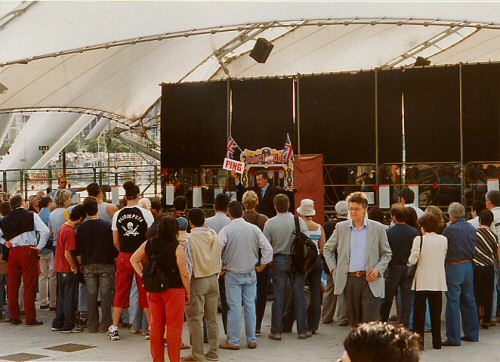 The next day, it was just me performing at the "Piazza delle Feste" in the Porto Antico area of the city. This is a very large waterfront area right next to the docks, which has ferries to North Africa and the all other countries on the Med. The performing area was like a covered area with seating for hundreds and a very large stage. I tried one performance inside and next we moved outside which was better for the audience as people walking past could see what was going on when they heard me ringing the bell etc and come over and see the show. It must be said, outside was very hot for working, so again, I lost about 4 pounds in weight ! It was of course for health reasons that I replaced this liquid with one made from grapes when finished performing..................! To celebrate the end of the festival Gino and Carlo had arranged for all the performers to have a meal together in a beautiful fish restaurant, with plenty of wine and food, we ended up getting to bed at about 2am. Next day back the UK, with all the gear making it back in one piece. As it was a bank holiday, the traffic seemed good and I got home in three hours from Gatwick to Leeds, so pretty good. A wonderful trip, but hard hot work. Anyone thinking of travelling abroad to perform, who has not done so before, do not think it is a walk in the park, as it is not. There are many barriers to overcome to give a good performance and just talking to so many people who can barely speak English is very wearing. I would love to be able to speak Italian of course, but cannot, so it more my fault not being able to speak their language. Even if I could speak Italian, I would have still performed in English, as this is Punch and Judy and should be performed in our native tongue, but it would have helped out the front to explain the plot and the times when the audience are to shout, but even without this Mr Punch did his stuff and was successful once again. I did manage to get the audience to do my magic word "Ping" - "Pang" - "Pong", all shouting at the correct time and performed some magic as an ice-breaker, which was very satisfying for me. Here is looking forward to Ghent in July. This is the official name of the festival, which is of course not that easy to read, but I think you get the idea. The festival this year was in fact combined with a medieval festival, involving music, sword fights, fire breathing and more medieval singing and dancing. I arrived on the Thursday afternoon, having made my trip from Stansted to Trieste by Ryan air, which is very cheap and a good service. You are only allowed 15kgs baggage, however I having my booth, puppets and clothing for the event were 30kgs, not including my very heavy hand luggage. I did not get charged on the way out for the extra weight, but the Italian check-in staff charged me �33 on the way back. Well the flight only cost �47 return, so cannot really complain. As the organiser: Robert Waltl of the Mini theatre, Ljubljanski Grad (which is the castle) was so busy putting the festival together, Ivan (young lad who helped out at the theatre) picked me up from the airport and drove the two hours over the border to Ljubljana and my hotel/hostel. My accommodation was unusual to say the least, an old prison. I got to stay in my very own cell for the five nights. It was all very modern and contempary in d�cor, but you still had the metal door and an inner door of bars, plus of course bars on the small window with no curtains. It is probably the most unique place I have ever stayed in, so made the trip even more interesting. It was now only Thursday afternoon and Ivan said, see you tomorrow night at 7pm at the castle. Well this left me with trying to now occupy myself until then. What to do I thought, the weather was good, so I journeyed out on foot around the city, which is quite small and very nice. The time was passing very well, plenty to look at the many places to eat and drink, but what to do at night. No TV in my cell and I am not one to sit in bars on my own, so I investigated the theatre scene of the city. There are quite a few theatres, but all the plays on would be in Slovenian and it cannot speak Slovenian, not many people can outside of the country, so I opted for the ballet. Which although the performance was a world premier, it was boring beyond belief. Very modern, with no scenery, costumes as such and weird music. I stuck it out and it filled the evening. On the Friday I walked up the castle in the afternoon to see if Robert Waltl was around so I could meet him. He was, so introductions were made and I was invited to attend an evening of 15th century music which lasted for an hour or so and then we hit the town for some tappas and drinks, so a good day. The next day was to be my first to work. City Park was the venue, a brand new shopping centre, which is the pride of the new Slovenia. I was like working at any shopping centre in the western world. The centre management had put a lot of money into the event, so wanted their �pound of flesh�, so I got the job. We live in a commercial world and this helps to finance these kind of events. I did give the chance to work abroad in the same kind of surroundings as back to home to make a direct comparison and it proved that puppetry is universal and appeals wherever it is performed. It was not the kind of venue I thought I would be performing in, however the audiences were good and I enjoyed the day. Of course it is difficult to get a Slovenian audience to shout back at your show, �oh no, I didn�t� does not mean much to them, so this aspect of the show was a little lacking, but I battled on and did get a good response to the slapstick comedy and timing. They laughed in the same places as they do here, so the language barrier was not so important. Having performed is several non-english speaking countries, it always amazes me that Punch and Judy does work wherever it is performed. I am not sure how a Punch performer would get on if their show relied totally on dialogue? I could name a couple of performers who I think would struggle perhaps, but you just do not know until you try. Sunday was the best day for me. I got to meet my fellow performers for the event at long last; Janos Paly from Hungary (performing Vitez Laszlo) and Salvattore Gatto from Italy (performing Pulcinella). These two performers are said to be amongst the best in the world, so it was great to be performing with such people, a real honor. We all did two shows each in the resident puppet theatre at the castle, Mini Theatre (it is quite small but perfectly formed, with a great atmosphere when filled). I went first to a packed house and got a good response. 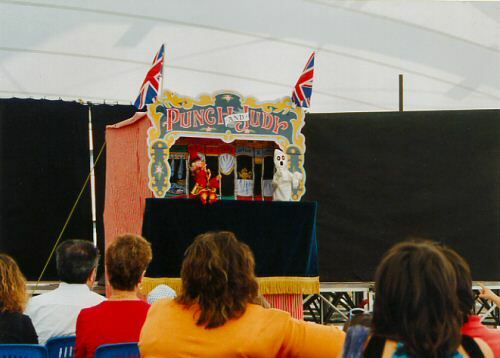 I went out the front of the show and explained a bit about Mr Punch and the history (with an interpreter) so the audience would have some idea what was going on. The show went really well and I felt good about being there. Janos went next with Vitez Laszlo, who looks younger than Punch (Vitez not Janos, although of course Janos does not look like Punch of course!) and Janos does not use a swazzle as the voice is not like our Mr Punch. A very fast show with plenty of slapstick with Vitez Laszlo using a frying pan to hit the other characters, which gives a great sound. A fantastic show and the audience enjoyed it. It has no audience participation like P&J, but of course is very entertaining and not unlike P&J in essence. Then it was the turn of Salvattore Gatto from Italy with his Pulcinella show. Salvattore comes on signing with a guitar, a song about Pulcinella (all in Italian of course), he has a great tenor voice so a great start to any show. If you have not seen Pulcinella performance before, try to. It is hyper fast and very slapstick. Nearly the whole show is dominated by Pulcinella (voice is done with a swazzle) and hardly any other dialogue from the other characters. You can really see where our Mr Punch gets his personally from here, it is the nearest relation to P&J. The audience did enjoy the show and Salvattore came out afterwards showing the puppet to the children and singing again. It must be said his is no �shrinking violet�. We all performed again that day to packed houses and at one of the performance we were told that the President of the Slovenian Parliament was present. My second show was blessed with an English family who lives and works in Slovenia. The mother and father could not speak any Slovenian and were over the moon when they saw an English P&J performing at the event and told me �they need a fix of the English language�. The children shouted back at the correct times at the performance, which helped the native children to follow suit, so it made for a better show with the traditional audience participation we are all used to. A great show for me and ensured I ended on a great note, so my memories of the festival would be fantastic. I had a free day on the Monday so made the most of it going all over the city and having a great goulash meal to finish off my trip. If you ever get a chance to visit Slovenia do so, it is great and if you ever get a chance to perform there, bite off their hands at the chance. It all started at 7am at Leeds Bradford Airport. I was a little worried about how heavy all my equipment would be, will they charge me excess baggage or will I get away with it. Well, I did, they did not bat an eyelid. My booth and puppets were only approx. 25 Kgs, so they allowed that. Flight from Leeds Bradford to Heathrow was fine and was advised to pick up my luggage at Heathrow rather than it disappearing at Leeds Bradford and being transferred to the correct flight, which was a relief as again this is another thing to worry about, will the luggage get there. Doing P&J with now puppets or booth would be quite interesting!. I took my baggage to the EL AL checking in which had several very long queues with armed police milling about. I was singled out and questioned for 30 minutes regarding why I was going to Israel, who I was seeing etc etc. I of course had the necessary work visa supplied by the centre in Holon, but again they wanted more information. Trying to explain what a P&J show is to an Israeli is an experience, they in the main have not heard of the show, even those working in the UK. They even resulted in telephoning my contact in Holon to obtain direct confirmation from my contact there. It all ended well and I was allowed to go through and wait a couple of hours for the flight. Once reaching Israel, it took me a good hour to be processed, but I made it will all my baggage. I was met at the airport and taken to a very nice hotel in Bat Ram, just down the coast. The next day I was scheduled to perform at the Steinberg Cultural Centre in Holon (a city which is next to and in fact merges with Tel Aviv) at 5pm and 7pm. This was an all ticket affair and was sold out. The audience was about 150 in size each performance, kept to this intimate size on purpose. I have my own interpreter and she did really well to keep up with the show, but it worked. I had all the children shouting back "Oh no you didn't" to Punch in Hebrew. This is perhaps a first as I do not know of any other Punch and Judy being simultaneously translated into Hebrew before. In fact I am not sure if P&J has been performed in Israel before, I could have been the first, but hopefully not the last. The next day I was employed to hold a workshop in the public libary for adults only and in English. I did not really know what to expect and was a little worried about having to fill three hours. Well I set up the booth and was ready with about half an hour to spare. The people attending the workshop started to turn up. All women who had purchased tickets months in advance and travelled from all over Israel to come and see me talk about myself and P&J. Well what an honour, it is not that often you get paid to talk about yourself and your work. Three hours was not enough time, only scratched the surface and was one of the easiest and nicest jobs I have ever had. I did the show for the ladies with the covers off, so they could witness what goes on behind the scenes. I did leave my backdrop on (I work hands in front of face) as this would have been a little off putting for me more than anything. This all went down very well and sparked off many questions about puppetry and Punch, so like I say, it was a dream job. I was then free to watch the other performers and have a tour of Tel Aviv and surrounding areas, so I did see a bit of the country. The next day I left for home and once through the very though security checks I had a great flight back to London and then onwards to Leeds. It was a great trip and I hope they invite me back one day. I was most fortunate to be invited to perform at this year's puppet festival in Ghent, Belgium, on Sunday 18th and Monday 19th July. I travelled by car on the overnight ferry departing from Hull to Zeebrugge, which did mean that I could take all my performing gear. If you travel by airplane, you are very restricted on what you can carry and I always feel that I do not have enough "stuff" with me, but this time, not a problem. The car was loaded and I crossed the North Sea to see what awaited me. The puppet festival is part of a huge festival which runs for ten days throughout the whole of Ghent, the place absolutely comes alive. 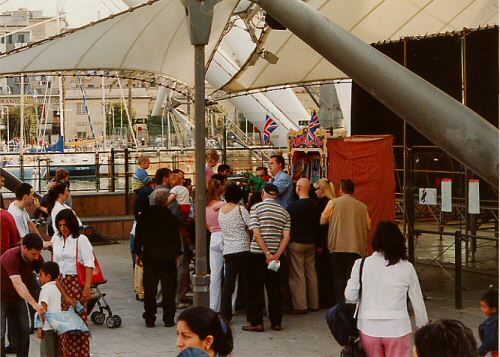 Bands, musical acts, buskers, puppets, some very weird performances and much much more. My first show was at the puppet theatre in the centre of Ghent: "Europees Figurenteatercentrum". I was due to go on at 6.30pm following a performance by Mamulengo Fantochito from Brazil performing his own version of a Punch type character. The audience was sitting and waiting, drinking fine Belgium beer and wine, all getting into the swing of things. I was introduced and some history of Punch and Judy was given to the audience in several languages other than English. 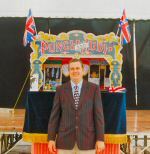 I went on in my normal way to "Oh I do like to be beside the seaside" on a fairground organ CD which I blast out and go around the front ringing my bell and announcing my show as about to begin. I then asked the assembled audience who could speak English. Thank heavens most could, so I got on with it. My warm up always consists of my magic word "Ping, Pang, Pong", which gets the audience used to shouting and is good for non-English speaking persons, as it is universal in that it does not really mean anything. Once this was out of the way, I did my show. The audience absolutely lapped it up, shouting and laughing in all the right places. Once finished, I came out and got a very warm response, which was most gratifying for me. That was it for day one, so tucked into some of the free beer for performers. Many people came up to me asking about Mr Punch, the way I did his voice (which is of course a secret) and very much about the speed of the show and the logistics of the movement of the puppets and timing of change overs etc. The next and my last day (could only fit in two days, due to UK work commitments!) I went off to a huge square called Braunplein, where I was to perform along side Jan Soldatt a young (26) Dutch player of Jan Klassen. He was a great laugh and we got on like a house on fire (he has invited me to perform with him in Amsterdam next year). I went on to a massive audience of approx. 500 people and Jan followed. Once finished it was a quick break-down and back off to the puppet theatre for my last performance. What a way to finish. The audience was brilliant. They shouted and laughed, clapped, heckled (in a good way of course) and thoroughly enjoyed the show, as did I. It was all over and apart from a good night out around Ghent, drinking and eating, it was sad to have to come home and back to the normal stuff. That said, I look forward to my next shows in the UK, which I am lucky to say are varied and interesting (well most), so he we go again, as happy as can be! I hope to be invited back to Ghent in future years for much of the same.